Heal is an homage to the Gees Bend Quilters of Alabama, a community of African-American sharecroppers who were cut off from their supply ferry by white residents across the river after they joined the civil rights movement in the 60s. Recycling everything they owned to make quilts to hang on their walls to keep out the cold, they ended up forming a cottage industry which kept them alive until their situation improved. 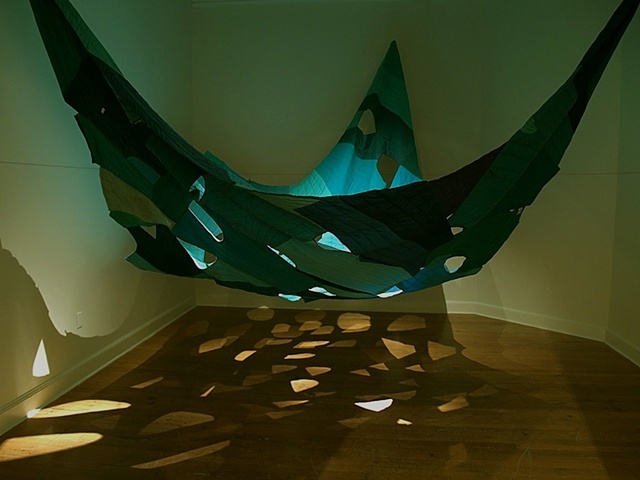 Made of recycled surgical scrubs and full of holes creating pieces of light and shadow, Heal is also a rumination on the state of our health care system.